Most state national guard headquarters have impressive, military oriented identifying titles or are named for an individual important to that state’s military history. The Florida National Guard headquarters is named after the gentlest of all Christian saints, St. Francis of Assisi. It may sound incongruous to link St. Francis with a military barracks, but it isn’t. The Florida State Arsenal is called the St. Francis Barracks for the good and simple reason that the site, even part of the present structure, served as a monastery for the priests of St. Francis and as a military barracks for the soldiers of several nations before becoming the modern home and headquarters of the Florida National Guard. When the Spanish first colonized Florida, they brought Jesuit priests along to minister to the needs of the settlers and to convert the local Indians. By the 1570s, the Jesuits were replaced by the priests of the Order of St. Francis. In 1588, they were assigned an area at the southern end of the small city of St. Augustine for their convent monastery and church, Nuestra Senora de la Concepcion. This land, the present site of the Barracks, remained in religious use until the British arrived in 1764. For the first 150 years of its use as a monastery, the site contained only log and palm thatch buildings. They rotted or were burned down in turn. Following the English invasion of Florida in 1702, which saw virtually every structure in St. Augustine destroyed, including the monastery, Spanish officials decided to rebuild all government and religious structures of stone, and to encourage its use in private reconstruction as well. Despite government malfeasance in the handling of funds, a substantial portion of the new monastery was constructed of stone, and was largely complete at about the same time Spain lost Florida to the English in the Treaty of Paris, 1763. As the Protestant British had no use for a Catholic monastery, they converted it into a military barracks for the St. Augustine garrison, even adding a larger wooden barracks on the adjacent property. Then, having lost the War of the American Revolution during which Spain was one of America’s allies, Britain was forced to give Florida back to the Spanish. When the Spanish returned to St. Augustine in 1784, they left the old monastery in use as a barracks for their garrison troops. During this Second Spanish Period the recently added wooden buildings burned down. In 1821, it was the turn of the Americans. After acquiring Florida from the Spanish by cash purchase, the Americans continued to use the old monastery building as a barracks for the soldiers of the local garrison. 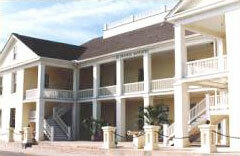 The building saw continued service as an active military residence during the Second Seminole War. During the Civil War it housed first Confederate, and later, Union troops, and later still, men of the regular army artillery. It was abandoned as a military post by the national government in 1900. Leased to the Florida State Troops, later the Florida National Guard in 1907, for its headquarters, it was formally given to them in 1921 by an act of Congress. When Congress gave the building to the national guard, it wasn’t in use; it had been gutted by a fire in 1915 and no state monies had, as yet, been appropriated for rebuilding. But the old walls and former cells for the monks were still standing, and finally, in 1922, the necessary money was made available. A few months later, the St. Francis Barracks once more housed the headquarters of the Florida National Guard. It still does.